And how I plan to style the looks in Los Angeles. I&apos;m what you might call a pathological people watcher. I might go so far as to call myself a people stalker, with my eyes. I obsessively notice what other people are wearing, and when I&apos;ve seen something two, three, four times, I realize, "Wow, this thing is really happening"–a full-scale trend. Being in Europe recently was very different from the first time I visited, ten years ago. At that time, Facebook existed, but style blogs were just beginning to sprout up, and the concept of following someone via Instagram and Pinterest didn&apos;t exist. That meant that whatever was big in fashion-forward and trend-setting countries like France, Italy, Spain, Denmark, and Portugal took months, sometimes years, to take hold in the States (I&apos;m looking at you, skinny jeans). There was a vast gap between how people dressed abroad and in America, which you could see just walking down the street and shopping. These days, everyone can see what everyone is wearing in milliseconds–and access the looks and brands online. It&apos;s made a lot of us look the same and adopt the same style, no matter where we live. Even still, for whatever reason, some trends don&apos;t quite make it across the Atlantic instantaneously. Over the near-week I spent in Paris, I kept mental (and iPhone) notes whenever I noticed scores of women wearing the same thing. The trends that emerged were undeniably distinct and all over the city. 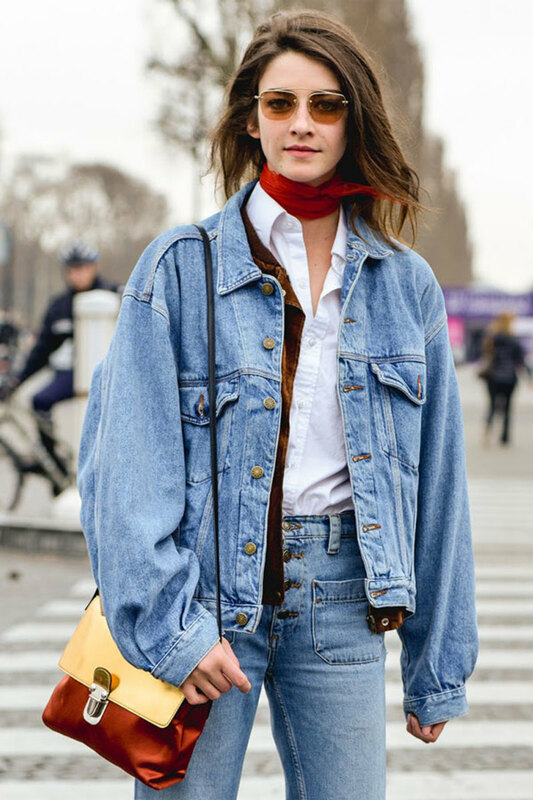 Below are the 5 things French women are wearing right now—and ways to shop each trend, because it&apos;s only a matter of time before they make it Stateside. I noticed a lot of Canadian tuxedos on a lot of people. It looked cool, chill, and wearable. The key is for at least one of the pieces to be kind of slouchy, oversized, and boyfriend-fitting. 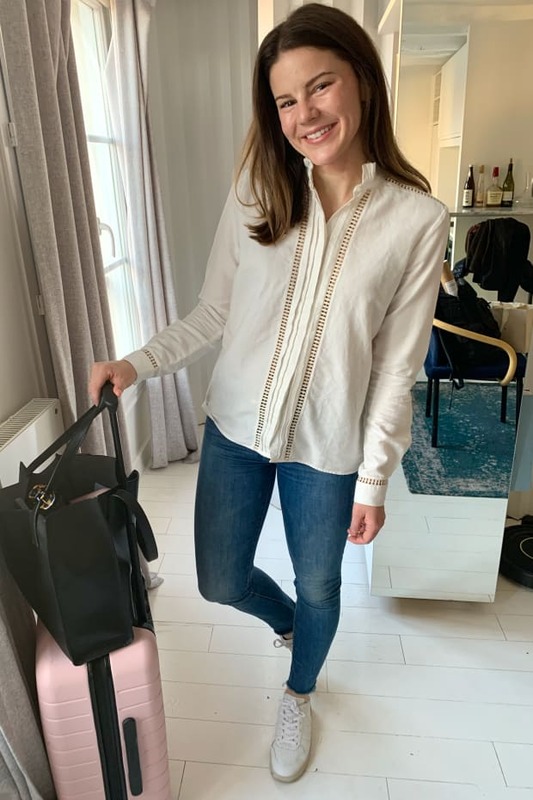 Most of the examples I saw involved a looser-fitting boyfriend jean—the denim on denim look doesn&apos;t have quite the same effect with a pair of wide-legs or bell-bottoms, which would feel more intentional and less effortless. The color sky-blue was everywhere: in cozy, cocoon-like blanket sweaters and coats, leggings, and crisp outerwear (like above). It was undeniably the color of the moment, which was reflected in the stores of three of France&apos;s biggest brands: Sandro, Maje, and Iro. Because the color is so cloud-like, the key to styling it in a sophisticated way is to make sure your accompanying pieces are sleek, tailored, and crisp (like Caroline Issa&apos;s black trousers, button-down, and pointy pumps above). Perhaps the most ubiquitous of the five trends I saw was thick-soled white sneakers of the Nike Air Force One variety. They&apos;re undeniably &apos;80s, a bit weird, and not altogether flattering (clunky, masculine, a bit dorky), but man were they abundant. I&apos;ll be honest that they&apos;re not my cup of tea (they remind me of what an avant-garde artist from the Eastern Bloc would have worn in an experimental electro-pop music video in 1987, with a black turtleneck, parachute pants, and a gray trench coat) but I do love white sneakers in general, so I pulled together a bunch of alternate options I&apos;m loving. 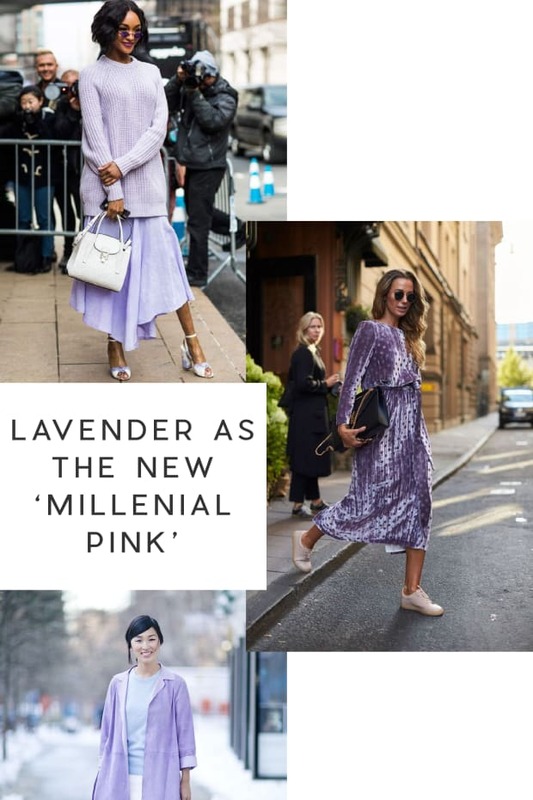 If you dip your toe into the water of this trend, you want to wear as slimming pieces as possible, since the shoes themselves are clunk-central (i.e. dark skinny jeans and elongating trenches). I saw two pairs of opaque tights to no less than forty examples of black sheer tights. Based on my observations I can conclusively say: when wearing black tights, French women wear sheer black tights. It&apos;s cold in Paris in the winter, but this is just what they do, and it looks elegant and alluring. There&apos;s really no wrong way to style sheer black tights, but sticking to an all-black color palette with different textures like above (cotton, leather, patent leather) will always look polished. I get that saying French women wear scarves might make you think, "okay Captain Obvious," but hear me out. 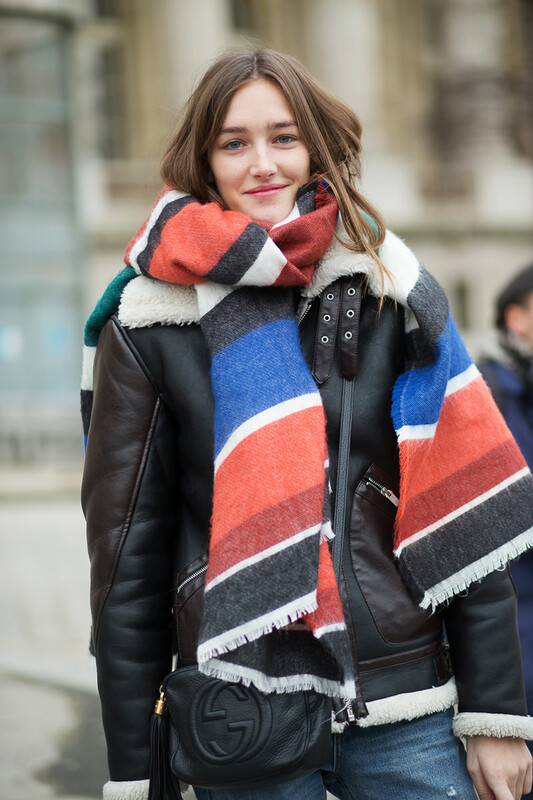 Scarves are approached as a category worth investing in. They&apos;re not utilitarian, and they&apos;re not just to keep you warm. They&apos;re gorgeous, high-quality, enveloping scarves that you can&apos;t not notice. Rather than blending in or taking a backseat to an overall winter ensemble, they stand out. They&apos;re as important as your coat and shoes—not just an afterthought you throw on when walking out the door. For my part, I invested in a chic white cashmere Acne scarf before going on the trip. I got it on sale for $100 from $180, and you can really see the difference between a nicer scarf and a budget one. The bigger the better (above), but a neutral one (like the white one I bought) will go with any outerwear (whether leopard or leather). P.S. One day after writing this post, I saw five Canadian tuxedos and two examples of thick-soled white sneakers while out and about in L.A.—while it wasn&apos;t as extensive as the numbers I saw in Paris, it&apos;s further proof that trends spread like wildfire these days, and that you can expect to see much more of these trends in the coming months. (And when Bella Hadid wears it, you know it&apos;s about to blow up).